Ben Katchor, a master at twisting mundane commodities into surreal objects of social significance, now takes on the many ways our property influences and reflects cultural values. Here are window-ledge pillows designed expressly for people-watching and a forest of artificial trees for sufferers of hay fever. The Brotherhood of Immaculate Consumption deals with the matter of products that outlive their owners; a school of dance is based upon the choreographic motion of paying with cash; high-visibility construction vests are marketed to lonely people as a method of getting noticed. With cutting wit Katchor reveals a world similar to our own—lives are defined by possessions, consumerism is a kind of spirituality—but also slightly, fabulously askew. Frequently and brilliantly bizarre, and always mesmerizing, Hand-Drying in America ensures that you will never look at a building, a bar of soap, or an ATM the same way. 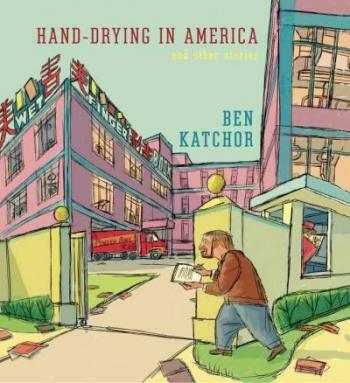 BEN KATCHOR is the author of The Cardboard Valise, The Jew of New York; Julius Knipl, Real Estate Photographer: The Beauty Supply District; and several works of musical theater with the composer Mark Mulcahy. He teaches at Parsons The New School for Design and has contributed to The New Yorker, The Forward, and Metropolis. The first cartoonist to receive a MacArthur Fellowship, he is the subject of the documentary The Pleasures of Urban Decay. He lives in New York.